Sam Naden and Rob Nelson from Paul's Fishing Kites fished Sam's big Two Kite Dropper Rig at the top end of Muriwai last Saturday. The winds were easterlies gusting from 15 to 25 knots, it had been raining and the swell was around a meter. They managed to get three sets out over the day. Set One The rip and tide run at the top end is extreme. Even though they had a Nighthawk Kite and Skyhook on the outside end of the gear it went out at an angle up the beach with the incoming tide until the Super Kite was attached 500 meters back from the main kites. As soon as the second kite lifted the line up out of the water the gear quickly powered straight out to 1000 meters offshore. It was a swing and a miss, when they winched the rig back their 20 hooks baited with a mixture of squid and mullet had not even been touched. Set Two It was about then Rob noticed the rain had discoloured the water for a long way offshore even though the tide was coming in. After re-baiting quickly with more mullet and squid they let the second set out to 1500 meters, Rob climbed a dune to see if they were past the discoloured water, it looked like they were right on the edge of it so they left it there. After leaving it set for an hour they winched it back in. Strike two, not one of the baits were touched again. Set Three - A Home Run For the third set they decided to let the gear out to just over 2000 meters. (Sams winch is loaded with 3000 meters of 65kg mono). When the gear got to 1500 meters they attached a Power Chute kite to lift the last 500 meters of line. Rob describes the way the rig shot out with three kites (Nighthawk, Super Kite and Power Chute) plus a skyhook as a thing of great beauty, although when the winch spool was locked off the gear was under immense load and the line howling for mercy. At this point Rob believed it would have been impossible to hand haul it in. When Rob climbed the dune this time he could see the five litre float well out beyond the mud and well into the blue water. Anyone who has fished a 1000 meter dropper rig knows that the load does not really peak until you have hauled a hundred meters or so of line in. This is because the float bottle and fish remain stationary untill the drop-line is on the shore side of the float. The tide had turned and was falling. When Rob and Sam switched the electric winch on, the pull from the gear went from extreme to brutal by the time they had 200 meters of line in. Regardless, they didn't stop the winch until the first 500 meters of line was in, and then only to disconnect the Powerchute kite. This relieved the load somewhat and the next 1000 meters was pulled continuosly until the Super Kite arrived back at the beach. At this point the load became manageable, but there was still a lot of weight there. Surprisingly, the PFK 200watt winch motor never even got warm at any point in the hauling. Finally the float arrived back at the beach, as the hook section neared the shore a huge snapper could be seen flapping on it's side in the surf. They carefully pulled the big fish in with the breakers, letting line go when the undertow seized the fish and hauling in on the next wave. The set had returned a total of two snapper to 11kg, three kahawai and two sharks from 20 hooks. It wasn't until the big snapper was cleaned that the third shark of the day was discovered. Incredibly a 30cm shark was swallowed whole by the big snapper and was found curled up in the fishes stomach. The small shark had teeth so it was not a dogfish, it was also fairly well digested so the snapper had probably not taken the shark from Sams line. Is anyone else aware of snapper eating sharks whole? On heading back down the beach Rob noticed the really muddy water was mainly near the top end of the beach. Heading down the beach the area from 10 kilometers north of Rimmer Road to Muriwai Township had blue water as close as 600 meters offshore in some areas. Next time it rains heavily Rob says he will think twice before heading all the way up to the top end. Hi guys - I hear you want some fishing reports! Tuesday 24th January was miserable! It was raining non-stop and blowing a gale in Auckland. But for two dedicated kite fishermen the easterlies meant a early trip to the Rimmer Road entrance to Murawai. We arrived about 8.30 to 25-35 knots easterlies! And the rain didn't stop the whole time we were there! We only managed to catch the kahawai on the third of four sets, so for the final set we baited half of the hooks with fresh kahawai and the other half with squid (which had caught six snapper in the first two sets). The results were amazing, eight more fish on the last set with six of these on the fresh kahawai! The fresh bait works the best! 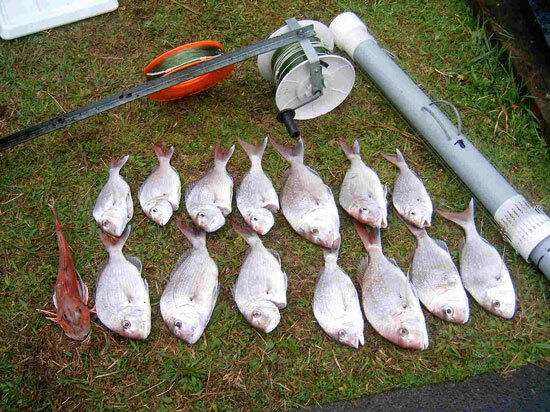 We managed a quick photo of our catch when we got home (it was too wet for the digital camera while at the beach). Photo Above : Snapper and gurnard, not bad for a wet day at the office! 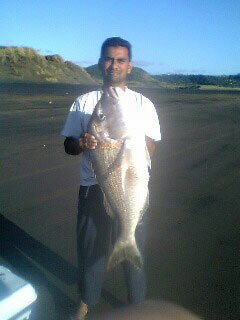 On the 23 January I had a fish at Muriwai Beach. The wind was a moderate easterly and an average surf was running. I fished the incoming tide and the gear set straight out. I use an abu baitcasting reel and jelly tip rod, spooled with around 300m of 50lb braid. Using a Flexiwing and Skyhook I sent six hooks out per set, my reel capacity was just enough for the hooks to make it to the back of the breakers. I had overtacked the kite both times, so when the drag was fully on, the kite kept tacking to the edge of the wind then stalling. Because of this I only set the hooks for 5-10 minutes each time. The kite even went down and self launched a couple of times because of the over-tacking. On the first set baited with squid I caught one snapper and one kahawai, which became bait for the second set. Unfortunately the second set caught a large shark which caused a nasty tangle. As I got the shark to the waters edge, I over-hauled the line, and the trace snapped. Still, I caught another snapper for the bin on one of the other hooks.